Scotch whisky, often simply called Scotch, is malt whisky or grain whisky made in Scotland. 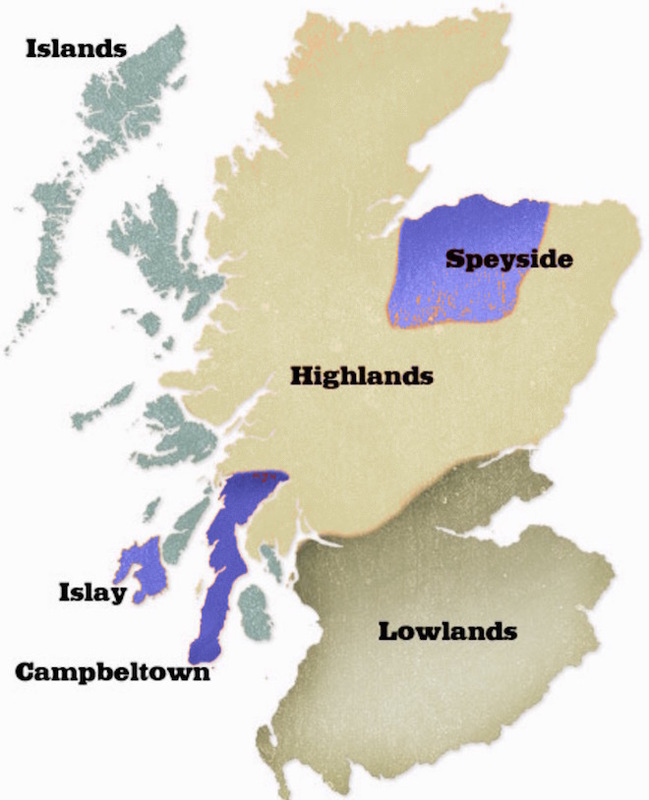 There are five primary scotch whisky production regions, namely: the Highlands, the Lowlands, Speyside, Campbeltown and island of Islay. 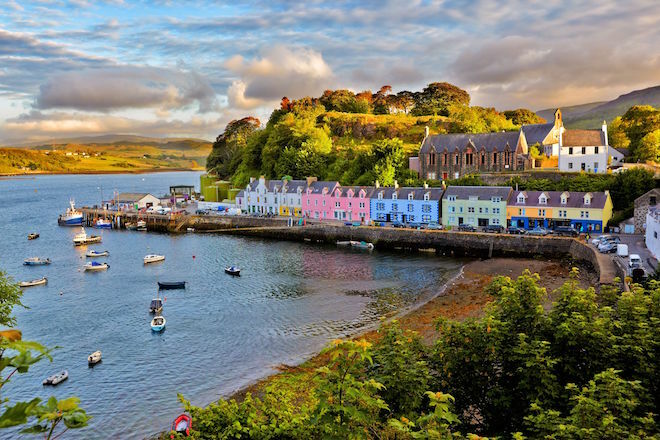 The Islands, which comprise all of the whisky producing islands in Scotland except Islay is traditionally considered as part of the Highland district, but some may also argue that it merits its own recognition as an region. 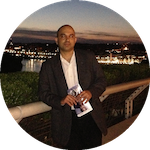 As with wines, these regions offer a guideline to the style of the drink rather than a rule. Although each whisky made at different distilleries is unique, the malts produced in each region have some common characteristics that separate them from scotch from other regions. 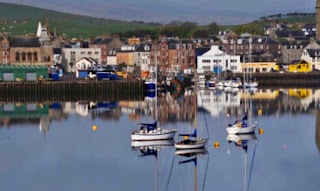 Lowlands is located at the southernmost part of Scotland, and is a flat region with no mountains. The scotch whiskies from this region are generally considered as the most light bodied of the single malts, almost wine like, as they do not use peated barley. Like the region, the Lowland malts suffer from a lack of windswept, buccaneering glamour, yet have their own gentle flavor with hints of lemon grass and floral aromas. There are only three operating distilleries remaining in the Lowlands, often called the three gentle ladies. 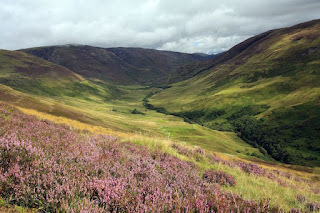 Visiting Lowland distilleries: From Edinburgh, it is half and hour's drive, or a little longer by bus, to Glenkinche. 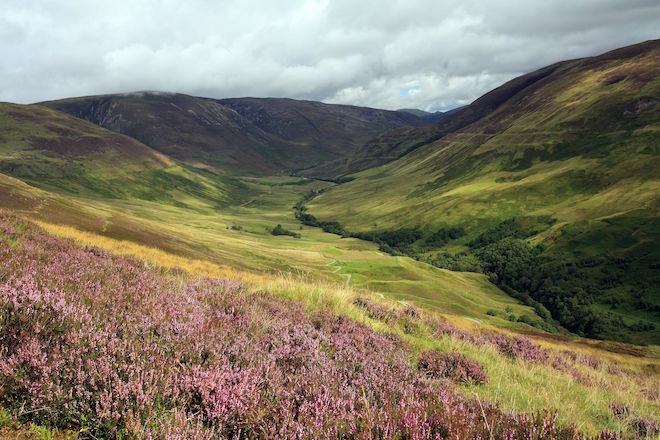 The Highlands is the largest of the whisky producing regions in Scotland and generally produces more full-body whiskies with deeper notes of peat and smoke. Due to the vast size of the region, Highland whiskies often taste very different from each other. The dominant flavor notes from a Highland whisky are honey, vanilla, caramel and heather, though there is a wide variation of characteristics based on the part of the region where it is produced. The western part of the Highlands tend to have a firm, dry character with some peatiness and saltiness, while the far north have several whiskies with a notably spicy character and the more sheltered eastern and southern parts have a notably fruity flavor. 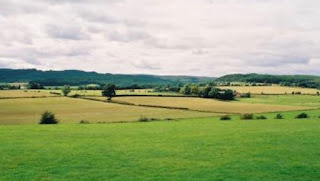 Visiting Higland distilleries: From Edinburgh, it is a drive of one to two hours to Perthshire distilleries such as Glenturret, Edradour, or Blair Athol. Famous distilleries: Oban, Glenmorangie, Dalmore. Speyside has the highest concentration of distilleries (more than half the distilleries in Scotland are located in Speyside). 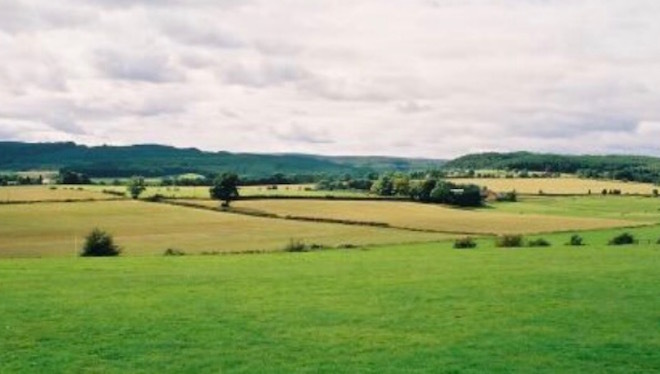 Although the Speyside region is geographically part of the Highlands, it is considered a separate region because of its unique characteristics. The region received its name from the river Spey, which cuts through the area. 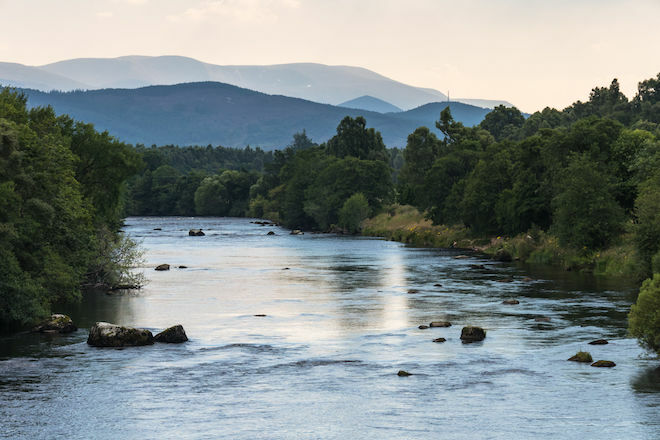 Many of the distilleries use water straight from the river Spey in their production process. Speyside whiskies are known for their sweet and fruity notes, elegant, complex flavors and aromas. Age often brings a bit more body and the usage of sherry casks adds a superb finish and sometimes a chocolatey richness. Visiting Speyside distilleries: From Edinburgh, it is between 3 to 4 hours drive to the distilleries in Speyside. It is best to carefully plan your itinerary, given the number of different distilleries. Famous distilleries: Glenlivet, Glenfiddich, Macallan, and blends like Johnnie Walker and Chivas Regal. 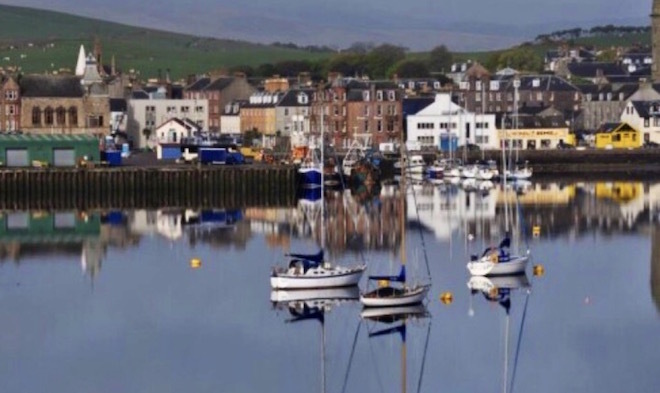 Once the whisky capital of Scotland, there are only three working distilleries remaining in Campbeltown. The Scotch here is peaty, and has a salty hint and a briny character. Famous distilleries: Glen Scotia, Glengyle, Springbank. Islay scotch is considered to be the smokiest and strongest-flavored of the single malts. Their strong flavor is believed to be due to the region's exposure to the high winds and seas of the west coast. 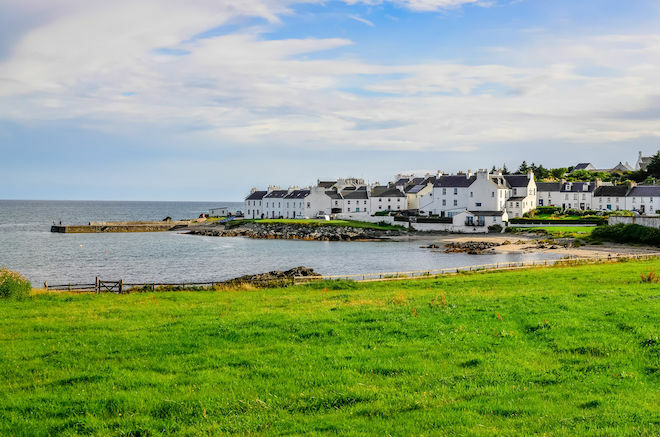 Famous distilleries: Laphroaig, Lagavulin, Bowmore, Ardbeg. 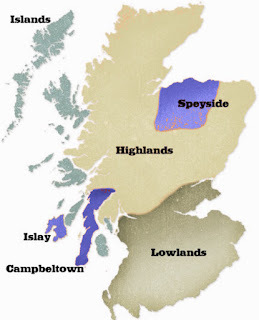 Traditionally, the Highland region has 'claimed' all islands except the Islay. Many enthusiasts however would argue that a specific style of whisky is made, to varying degree, on all of the islands. The main islands are - Arran, Jura, Mull, Skye and the Orkneys. The scotch from the Islands can be described as sort of a hybrid between Highland and Islay whiskies. The island character is strongest where malt is made with local peat as it absorbs other influences, especially the briny saltiness. 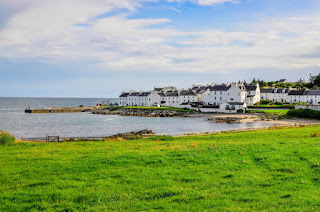 Famous distilleries: Highland Park, Talisker, Jura, Scapa.